(Leah Hogsten | The Salt Lake Tribune) We've forgiven over the years, but we're never going to forget, said Darren Parry, chairman of the Northwestern Band of the Shoshone Nation, Tuesday, May 8, 2018, of the tribe's plan to build the Boa Ogoi Cultural & Interpretive Center to educate and enlighten the public about the history of the Northwestern Shoshone Band, their life ways, enduring spirit and the 1863 Bear River Massacre, the single largest mass killing of Native Americans in United States history. 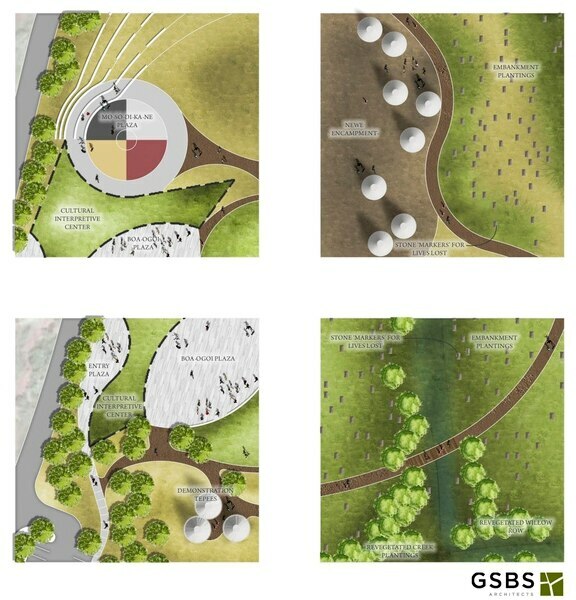 Architectural rendering courtesy of GSBS Architects The Boa Ogoi Cultural & Interpretive Center's Mo-So-Di-Ka-Ne Plaza (top, left) represents a traditional medicine wheel. The Boa Ogoi Plaza (bottom, left) serves as the transitional area between the center and the Bear River Massacre Site Area, complete with demonstration tepees. The Newe Encampment and embankment areas (top and bottom, right) provides passive reflection of the 500 boulders that represent the lives lost and the Shoshone Nation's re-created winter encampment. 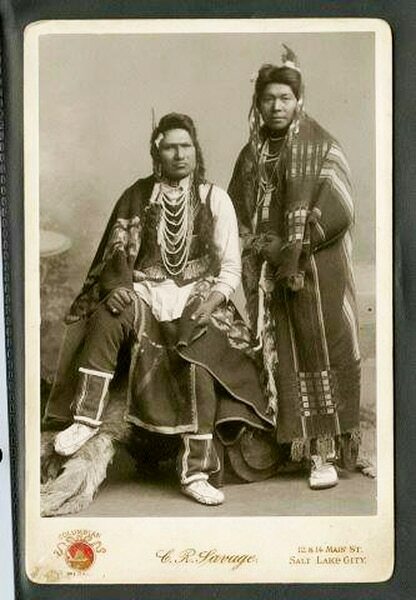 Photograph courtesy of Darren Parry, Chairman of the Northwestern Band of the Shoshone Nation An undated photograph of members of the Northwestern Band of the Shoshone. Photograph courtesy of Darren Parry, Chairman of the Northwestern Band of the Shoshone Nation A photograph of Henry Hootchew, member of the Northwestern Band of the Shoshone, 1930. Photograph courtesy of Darren Parry, Chairman of the Northwestern Band of the Shoshone Nation An undated photograph of the Northwestern Band of the Shoshone, who were living in the Bear River Basin near Franklin, Idaho. (Leah Hogsten | The Salt Lake Tribune) We've forgiven over the years, but we're never going to forget, said Darren Parry, chairman of the Northwestern Band of the Shoshone Nation, Tuesday, May 8, 2018, of the tribe's plan to build the Boa Ogoi Cultural & Interpretive Center to educate and enlighten the public about the history of the Northwestern Shoshone Band, their life ways, enduring spirit and the 1863 Bear River Massacre, the single largest mass killing of Native Americans in United States history. Architectural rendering courtesy of GSBS Architects The Cultural Interpretive Center will offer a glimpse into the Northwestern Band of the Shoshone, who were living in the Bear River Basin in January 1863. The center will not only be a space to tell the story of the Bear River Massacre and honor the lives of the Northwestern Band of the Shoshone Nation who were killed January 1863, but it will also celebrate the thriving Shoshone Nation and educate the public about their culture. (Leah Hogsten | The Salt Lake Tribune) l-r Darren Parry, chairman of the Northwestern Band of the Shoshone Nation and architects David Garce and Baylee Lambourne with GSBS Architects, give details about the Boa Ogoi Cultural & Interpretive Center,Tuesday, May 8, 2018. The Northwestern Band of the Shoshone Nation's interpretive center, located near Franklin, ID will educate and enlighten the public about the history of the Northwestern Shoshone Band, their life ways, enduring spirit and the 1863 Bear River Massacre, the single largest mass killing of Native Americans in United States history. (Leah Hogsten | The Salt Lake Tribune) l-r Darren Parry, chairman of the Northwestern Band of the Shoshone Nation and architects David Garce and Baylee Lambourne with GSBS Architects, give details about the Boa Ogoi Cultural & Interpretive Center,Tuesday, May 8, 2018. The Northwestern Band of the Shoshone Nation's interpretive center, located near Franklin, ID will educate and enlighten the public about the history of the Northwestern Shoshone Band, their life ways, enduring spirit and the 1863 Bear River Massacre, the single largest mass killing of Native Americans in United States history. Architectural rendering courtesy of GSBS Architects The Boa Ogoi Cultural & Interpretive Center's 6,000 square-foot architecture was designed to show deep reverence for the sacred land and what the land means to the Shoshone People. The exterior will have several plazas, walking trails with information kiosks, an outdoor amphitheater. Architectural rendering courtesy of GSBS Architects The Boa Ogoi Cultural & Interpretive Center's 6,000 square-foot architecture was designed to show deep reverence for the sacred land and what the land means to the Shoshone People. The exterior will have several plazas, walking trails with information kiosks, an outdoor amphitheater. Architectural rendering courtesy of GSBS Architects The Boa Ogoi Cultural & Interpretive Center's 6,000 square-foot architecture was designed to show deep reverence for the sacred land and what the land means to the Shoshone People. The building is tucked into the hillside in such a way that it can be difficult to distinguish from the surrounding landscape. The center will house exhibits of artifacts and information about the history and culture of the Shoshone Nation, classrooms and a bookstore. The center will tell the story of the lives lost in the Bear River Massacre and will also celebrate the survivors of the Shoshone Nation and their culture. Architectural rendering courtesy of GSBS Architects The Boa Ogoi Cultural & Interpretive Center's 6,000 square-foot architecture was designed to show deep reverence for the sacred land and what the land means to the Shoshone People. The exterior will have several plazas, walking trails with information kiosks, an outdoor amphitheater. When you stand on the trail and look out over the grassy valley, you’ll see 500 weathered stone pillars scattered over the landscape. Some of the boulders will stand alone by the creek. Others will be planted together under willow trees. All will serve as gravestones for people who never got one. The grim markers, part of the early plans for a memorial to be built at the site of the Bear River Massacre, demand that you stand above the area of carnage and see the full scope of the atrocities that happened there. It’s meant to be a commemoration as much as a confrontation, unlike anything the country has ever seen to memorialize the killings of American Indians. “We’ve forgiven over the years, but we’re never going to forget,” said Darren Parry, chairman of the Northwestern Band of the Shoshone Nation. The tribe paid $1.8 million in January to finalize a monthslong deal to acquire the land, roughly 550 acres near Preston, Idaho, where its ancestors died in the 1863 massacre. Now that it owns the parcels, the band intends to tell the history of the place from its perspective. 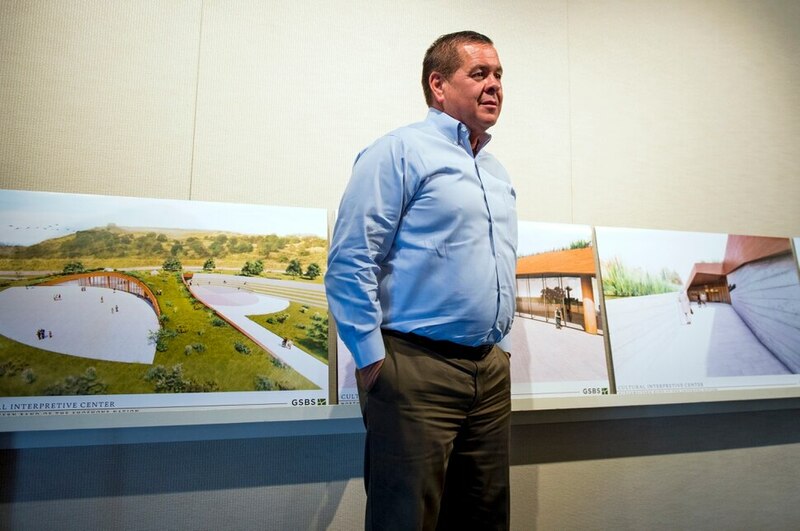 Parry has worked with GSBS Architects, a Salt Lake City firm, to develop renderings for an interpretive center and trail system at the site. As visitors drive to the memorial on Highway 191, the first thing they’ll see is a row of teepees, recreating a Shoshone campsite. There will also be an outdoor amphitheater and a 6,000-square-foot exhibit building tucked into the hillside with large windows and wood beams to blend in with the natural terrain. “The hills come above you, and it’s almost like you’re walking into the earth,” said Baylee Lambourne, one of the lead architects. The firm had pulled together three or four different designs, but the tribe’s leaders quickly and unanimously agreed on the one titled “Reverence.” They hope it brings peace to a landscape that’s still filled, for many, with hurt. They hope it serves as a reckoning for past racism. About 250 volunteer soldiers from Utah’s Fort Douglas raided the tribe’s winter camp at dawn on Jan. 29, 1863. They attacked with the intent of punishing the band for interfering with mining supply wagons and killed hundreds of Shoshones — estimates range from 250 to 500. The militia, too, beat children and raped women. The blueprints for the interpretive center were done largely pro bono, but building it will cost about $5 million. Parry’s goal is to collect the money over the next year (donation forms can be found at www.boaogoi.com). As part of the plans, Shoshone leaders also intend to restore the landscape to what it would have looked like in 1863 through a partnership with Utah State University, which has done extensive field work in the area. That will require digging out thick patches of nonnative Russian olive trees and reintroducing more willows. The Bear River that once ran through the area has shifted since then with nearby dams and is no longer on the land where the massacre occurred. In its place, the memorial design plots a curvy stream of trees to replicate the flow. David Garce, a landscape architect working on the project and a member of the Catawba Indian Nation rooted in South Carolina, said it’s symbolic of growth. The tribe plans to name the center Boa Ogoi, which is Shoshone for “Big River.” It will honor the dead while celebrating the descendants that live today. Parry said it’s a model his late grandmother, Mae Timbimboo Parry, would have been proud of. She lobbied for decades to secure the massacre site for the tribe and was the granddaughter of Chief Sagwitch, who fled the Army’s attack 155 years ago and later led survivors to join The Church of Jesus Christ of Latter-day Saints. She used to tell Parry: “Everyone has a story worthy of being told.” He has kept that in mind throughout the interpretive center design — and it’s why he wants to represent the tribe’s narrative in stone. That way, it’s immense and unavoidable and immovable.